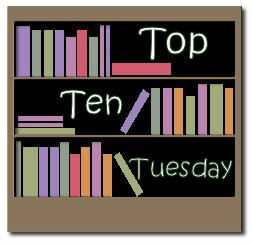 Top Ten Tuesday is an original feature/weekly meme created and hosted at Broke and Bookish. Well, I got caught out good and proper – I went by the master list for up-coming Top Ten lists, but then it got changed, so I’m doing a second list for today! This entry was posted in Books and Reviews, Memes, Pastimes, Top Ten Tuesday and tagged Book Review, Books, Domestic Goddess, Memes, Top Ten Tuesday. Bookmark the permalink. I love the list! I hope you enjoy Shiver. It was such a great series. I loved it a lot!! Thanks for stopping by! Love Love Love Armstrong. The Gathering was fantastic and cannot wait for The Gathering. Also did not have Cinder on my list but definitely want to read it too. Great list! Great list. I hope Santa takes good care of you! Cinder does look fantastic, and I really enjoyed Anna Dressed in Blood. Happy reading! SHIVER is great. I loved the series. I love your top ten list, awesome books. Thanks for stopping by. Ooh yes, read Shiver! I love that book – it was the novel that allowed me to fall in love with Maggie Stiefvater’s incredible writing. Thanks for stopping by! Sisters Red is awesome. I also love all the Jane Austen variations I’m seeing on your list. I am a fan of Amanda Granges diaries. Good luck with your list! I just posted my review of Anna Dressed In Blood last night! I loved it! It was one of my top reads this year! Check it out if you get a chance! Also, I adore anything by Jackson Pearce! She is so witty, funny, and awesome! Enjoy your books! I’ve heard good things about Sisters Red. Thanks for stopping by! Oh The Gathering is good! And i usually am not that into YA, but you’ll really like it. I want to read “The Women of the Cousins’ War” too. I haven’t read any Philippa Gregory yet, so I want to do a couple of her earlier ones first. I loved Shiver! That book is amazeballs… Plus, I’m a huge Jane Austen fan, so these are looking like some good books to get. I’ve read Mr. Darcy’s Diary by Amanda Grange, and it was really good. I’ve got an Austeniana about Mary Bennet and a couple of suitors–forgot the title! But, every P&P fan wants to get her married off, ya know. I like the mix of adult and YA you have! Cinder is calling to me so hard on my shelf, but I must resist until after finals! Thanks for stopping by my Top Ten post! I should add Sisters Red and Anna Dressed in Blood to my TBR list as well :). Thanks for dropping by my Top Ten Tuesday post too! I adore Kelley Armstrong. I can’t wait to read the sequel of this series. The first book was addicting! I’m dying to read Anna Dressed in Blood, too! I’ve heard such amazing things. I hope to make it a winter read, too. And Maggie Stiefvater is such a beautiful writer. Great list! I think SHIVER is a perfect winter read with all the snow. Loved ANNA DRESSED IN BLOOD too. Hope you get to them all this winter! I’ve been wanting to read Sisters Red for the LONGEST time! Oh, and I am so excited for Cinder. Thanks for dropping by my blog. I have heard that Anna Dressed in Blood is a quite good book. Gulp. There are so many good books out there and I don’t know how I will read them all!